Exploring the world by bike! Elektrycne Gitary is a very popular band in Poland. We are lucky to know Patryk, the son of the bassist of this band. We used the song “Nie pij Piotrek” for the video of our cycling-trip. We like this song very much, because a small part of the song is in German, a language we understand. The biggest part is in Polish, which we don’t understand, but the rhythm is good for cycling! In stead of 2 we cycled in 1 day to Prague (93km), our final destination. It was a nice cycleroute, not too difficult neither too hot. In Poland we didn’t see much cyclists and mostly in the city. In Czech this is totaly different. Al cyclists we see are mountainbikers, in the cities there are less bikers. Most of the Czech cyclists greeted us with “ahoj!” which sounds like we’re in a pirate movie and made us smile :-). 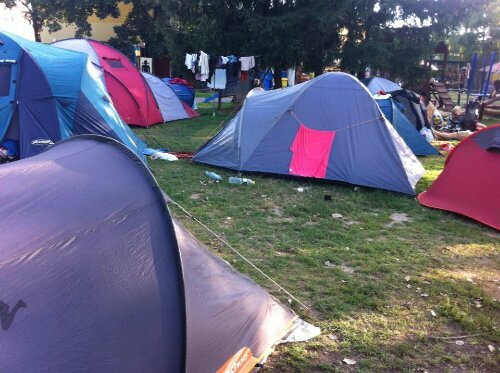 We stayed at the city campsite of Prague, 2km from the city centre, which looked more like a music festival then a family campsite, especially after some heavy rains when the grass was turned into mud. We had plenty of time to get a good first impression of this big beautiful city, which has a lot of cute streets, old squares, beautiful buildings, nice restaurants and beergardens. Too bad there are also quite some places with an overload of tourists, who are visiting the castle and staring at the ‘amazing’ anatomical clock. We had a lot of fun with people who we’ve met at a Couchsurfmeeting, so we met them the days after again for some diners and drinks. 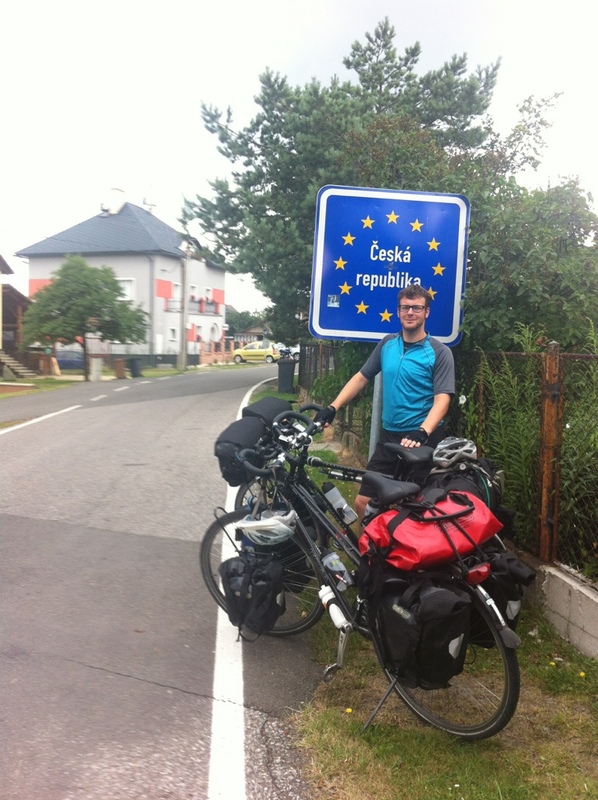 A good ending of our cycletrip through Poland and Czech Republic! As predicted friday was pretty hot (34ºC) but it were the hills which made this a hard day. Fresh from the start we had to climb a 12% hill directly followed by a less steep but very long climb. Later the day we had a few more hills of 12% and even 14%. We managed it again and we safely arrived in Brno. Because our hosts would be at home later in the afternoon we drove into the city centre which really looked beautiful. In the evening we went with our hosts (Matej and Bara) and their friends Jan and Micha out for a few beers. 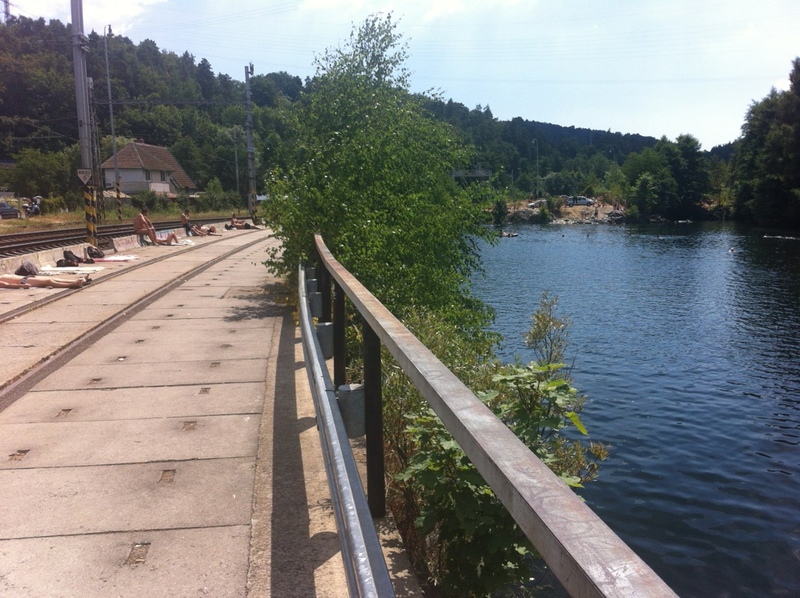 Saturday should even be warmer (38ºC) so it would be too hot to do anything, so we went for a swim in a nice cold lake next to the railroad, sunbathing on concrete. The water was superb. It was the best way to spend this day. Too bad the last white parts of our body turned into red! After a day of sunbathing we haven’t really seen Brno. Sunday would be as hot as saturday and there would be rain and thunder in the evening, so we decided not to go cycling, but take a try to see the city. The centre is really nice but rather small so one day was enough for us. In the evening we had great homemade (by Bara) strawberry-dumplings and great Czech wine! Our weekend in Brno was a perfect one for us, thanks Matej and Bara! On monday we took the train to Kutna Hora (60km east of Prague) which is very beautiful and on the Unesco world heritage list. Yet two days (easy going because of the temperatures) to go to arrive in Prague. After Oswiecim (Auschwitz) we had to cross the border with the Czech Republic. We woke up with heavy winds and rain. The temperature difference between this time and the day before was 20 degrees! Happily it was dry and wind lay down when we left the campsite. On our way we had some light rains but the temperature was ok for cycling, so that was no problem. After 70 kilometers we found the border and like on the border of Lithuania and Latvia we had to cross it illegally. This time we found a real border a few kilometers further. 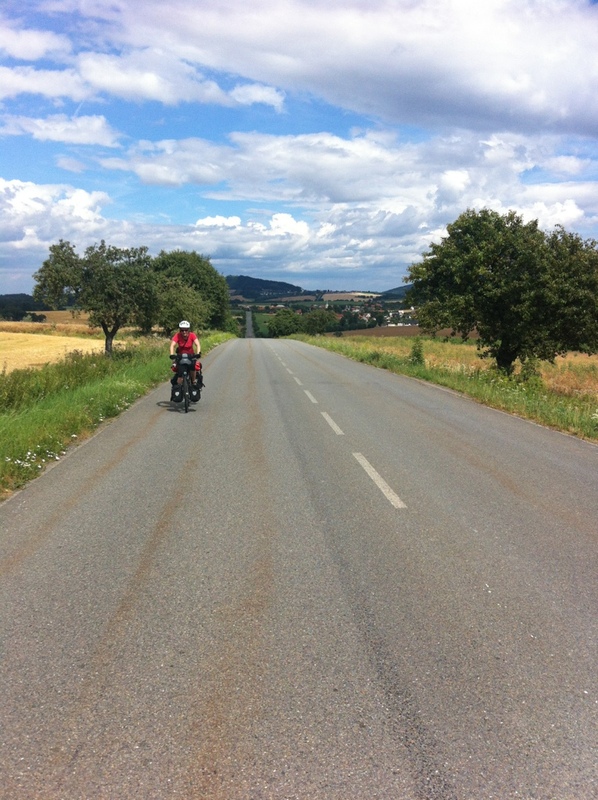 The first morning in Czech was hard, right out our bed and hotel we had to climb a few hills (12%). We got a little scared and decided to take a detour which leaded us over some nice roads. At the end of the day we had to climb again a few 12% hills this was still hard but far easier then the one in the morning. Today we took it easy, by accident Koen found a nice cyclelane, on the banks of a river, starting 200m from the campsite which would lead us for 30km to Prerov halfway the distance for this day. Tomorrow we’ll go to Brno depending on our hosts we’ll have a day of rest or go for a cycletrip to a Czech wineregion! Yesterday we drove 85km from Krakow to Oswiecim (Auschwitz). As predicted the weather was beautiful for those who love sunbathing or doing nothing, but not for us! There was a clear blue sky and the temperature reached up to 37. After half of the kilometers we ran out of water. Because it was a sunday all shops were closed so we decided to ask locals for water. After some negotiations between Sabine and 3 Polish kids we got our bottles filled plus a glass of lemonade because we were fools!!! They couldn’t believe we came from Krakow and we’re heading for Oswiecim, specially because of the weather. This morning we went to Auschwitz and Birkenau. Both camps are really impressive and interesting. Specially the size of Birkenau and the efficiency of both camps were ‘amazing’. As Birkenau is an open area with no shade we decided to leave it as quickly as possible and to go back in the evening, as it is 5 min. by bike from the campsite. This time we were almost alone which made the place even more impressive! After a great weekend in Warsaw we left Kasia and her family (thanks again). We drove in 5 days to Krakow where we are now. The landscape is beautiful and very widely. We’ve got great views especially when it’s hilly. The cycling is pretty heavy when there’s no flat part. The headwind makes it even harder. We’ve camped in very nice villages with only Polish tourists. The main roads are often busy but the asphalt is mostly good. The small roads are very quiet but sometimes they look more like patchwork than a road. The worst till now were the roads through forests. It’s clear google never uses bikes for it’s streetview, they think you can cycle everywere but the loose sand makes it really impossible. 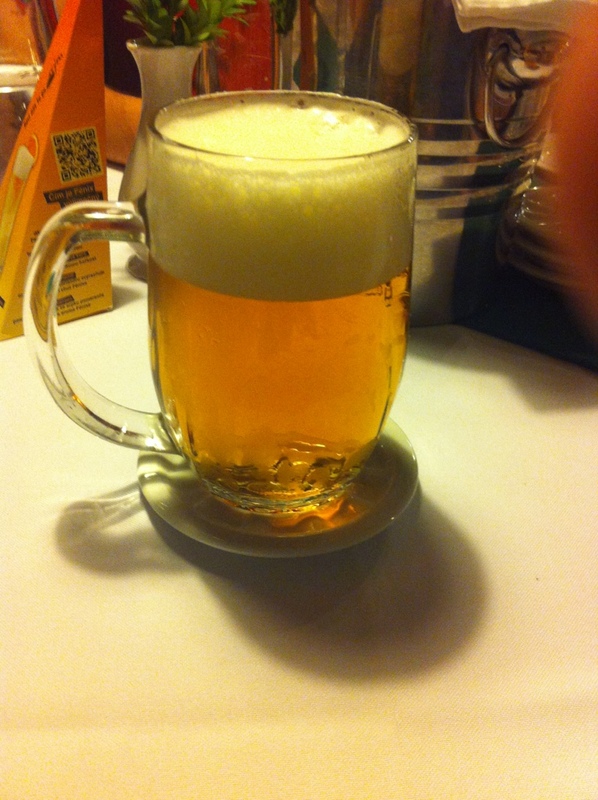 Today was our last day in Krakow. 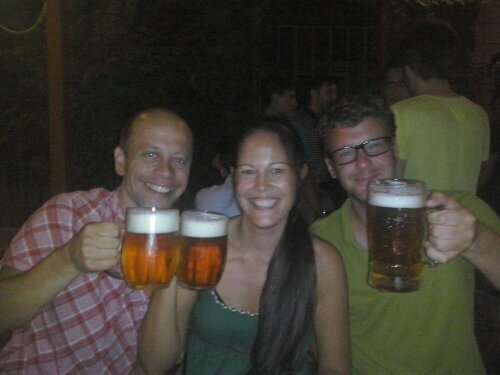 We had a great time in this nice city and with our hosts Marta and Marcin (thank you!). We even went back in communistic times with them. 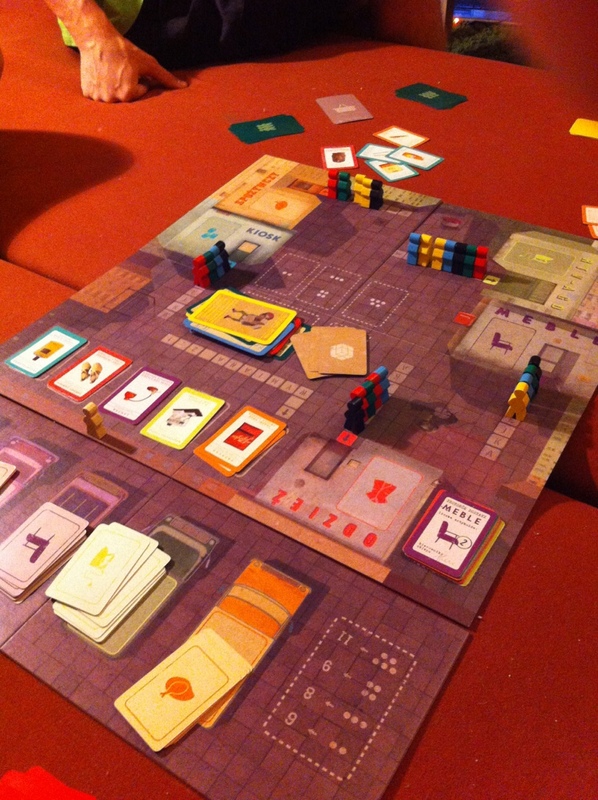 They showed their communistic neighbourhood and we’ve played a game about queuing to get your groceries. 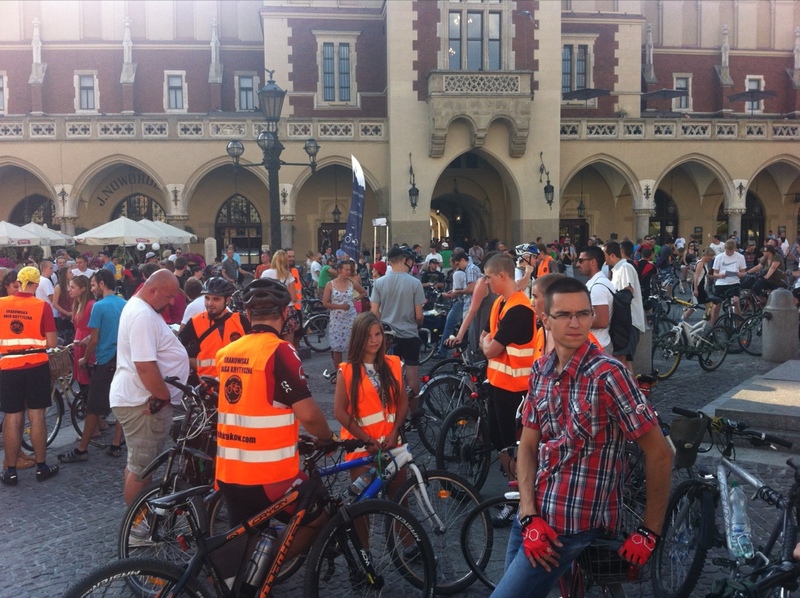 We specially enjoyed the bike-protest with 540 persons to ask for better rules and infrastructure! Let’s hope our help has been of some use. If not, we at least enjoyed ourselves! Tomorrow we’ll cycle to Oswiecim (Auschwitz) mostly on the banks of Wisla-river, so hopefully it won’t be a hard day, the temperature of 34 degrees is already killing enough!! After being back from India for 6 month already, it’s time for our next trip! Like most people know, we’ll stay closer to home this time. We’re going to cycle from Warsaw via Krakau and Auschwitz (Poland) to Brno and Prague (Czech Republic). 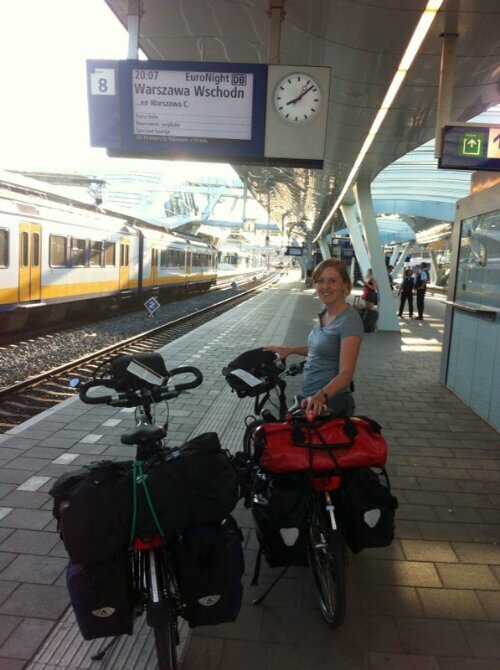 Thursday we entered the night train, directly from Arnhem to Warsaw. It wasn’t easy to enter the right wagon with our bikes packed with luggage. A big Polish conductor told us to go to the back of the train. Running to the back a german conductor told us from a distance to enter the wagon where we were. The polish conductor told us again not to enter here. 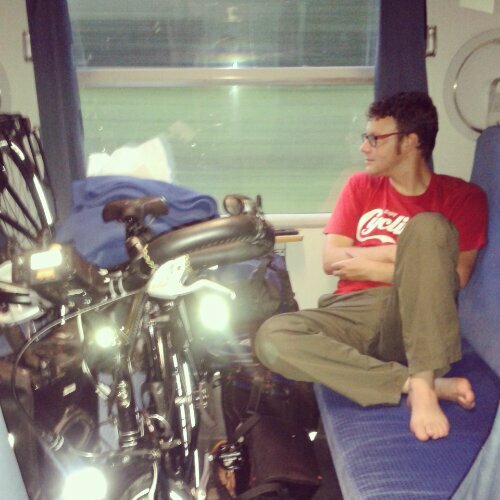 After running three times from one side to the other (dutch conductors were looking to it like watching a tennismatch; left – right – left – right), Koen pushed his bike up the stairs into the small door of the train and forced the polish conductor to step back. The german entered also and said to the Polish conductor “I’m the boss and they have to park their bike in couchette no 7!” We had to sleep in another, but in the end we slept in the same couchettes as our bikes. Now we are couchsurfing in Warsaw at Kasia’s place who we hosted before in Breda. 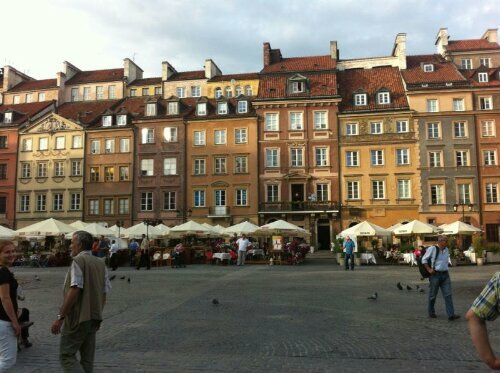 We had dinner in the big garden and already visited the beautiful centre of Warsaw, which looks old but it’s totally rebuild after being destroyed in world war II. We’re looking forward to see more of this country, the first impression is already very good!